This weekend it was 13u girls along with the 4 Tiers of 16u ladies and the 15u boys who battled on the plastic. The club was represented by the Rattlers and Sidewinders, BlackJacks, WildCards, gamblers, Aces and Chargers. Filling both the morning and afternoon wave with plenty to see and lots to cheer about. Again I will begin with our youngest group the 13u girls, both teams qualified in Tier 1 this season so already that is a huge victory for us here at the Club. As many of you know this is a triple-ball format tournament and as such games can swing with the drop of a hat. Plus for many this event brings on so many new opponents as the East and West do not ever cross at this age group until now. The Rattlers are coached by veteran volleyball person John Salem, and his years of experience would serve him well over the weekend. The Rattlers entered the event with the 14th seed and at the bottom of their pool. This meant for a tough uphill battle for the girls against top finishing teams from other zones. Friday looked familiar to me as the girls went 0-3 but battled in every match. Saturday was the day the team needed to rebound and regroup. 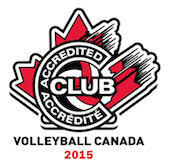 Only the top team in their Saturday pool would advance to Tier 1 Div 1. An opening round loss to the Durham red team would seem to have sealed their fate but the glimmer of hope was there and after a thrilling win over Stratford in three and a win over the Scorpions from Cambridge the Rattlers found themselves winning an unlikely tie-break and advanced to the top Division. Sunday morning was going to be tough as qualifying in this manner is exciting for everyone involved but it usually brings about a really high seed in the round of 16 and of course Sunday was not different. Bring on Markham Merge the number 2 seed entering Friday. Certainly the toughest opponent on the weekend as witnessed by a 7-25 defeat in the first set. But our courageous vipers had a bite left in them. A phenomenal team effort in the second resulted in a sound 25-20 victory and it was off to the crucial third set. The Rattlers gave it their best and despite the 4 point loss were competitive til the end. Great job and great recovery gang. The Sidwinders are our youngest of the young with many roster players being of the 12u age, so being in Tier 1 was already a huge victory for coach Andy Slutier knowing that many would use this experience to springboard their season next year. As the 26 seed they knew a tough weekend lay ahead. 8:00 am Friday began with an opening round win over the KW Predators and the team was uplifted for the weekend. There day was a little more sour after that with losses to Leaside and Durham. The win did however maintain their placement in the draw. Early Saturday the girls played their second match, a tough three set loss to Etobicoke, one that was two points away from a sweep. I guess these girls are morning people, as the next two were not so close and the team fell in straight sets to both Chatham and Niagara. (Again two completely new opponents) Now usually a low finish means an early start on Sunday which would play into our favour based on the previous days but it wasn’t to be as the opening bell was 11:30 and the Sidewinders are ready for some shade by that time of the day. The girls gave it their all but the scorpions won this battle of dessert predators in 2 games. As mentioned the future is where these young ladies live and we can’t wait to have them back in colours next season. Over to the boys side the Chargers are the true example of our LTAD development first approach and Coach Mike Spears and crew have held to this model throughout the season. The plan of development will often lead to lower than deserved finishes. But that has never become an issue because this would take care of itself by the Championship weekend. Not this year however, putting development ahead of results was punished by a schedule that would not allow a team in a Div 1 draw even the most remote of possibilities to surprise or “peak” at the right time and challenge for even a medal. Even if the Chargers went on a perfect run the best they could hope for was ninth. So much for LTAD and learning to train, but I digress. For their part the Chargers got over this quicker than I have and made a bee-line for that top position like it was a golden reward. Good for them and the coaches for making the best of the situation. A pool of seven draw means you play 6 matches over two days and then playoffs. Opening wins over Niagara and London followed by a tough loss to Barrie meant a perfect day Saturday would be needed to maintain the dream. Saturday afternoon came around and the Chargers bolted out of the gates with very one sided wins over Toronto West, Pegasus and the Guelph Grizzlies. So Div one Tier 2, the best they could do, was one for Sunday and the goal of proving they could be more. Opening round, the Chatham BallHawks put a scare into the boys but determined they prevailed in three. Then a sweep of the #7 seed Scorpions gave them the taste they needed and evidence of their ability. A semi-final win in convincing manner over the #12 KW Predators left only the Tier 2 final to complete the mission. Herre a number 10 or 9 seed would be expected as your opponent, but instead the Chargers ran headlong into a rather ornery group of Vipers. This team entered Friday with the #4 seed and slipped into Tier 2 after pool play, certainly something they wanted to prove was not their place. So the battle of wills took place for the gold and the Chargers fought hard in the first losing by 4, but they could not muster enough to continue and succumbed to the Vipers in the end. Still their demise came at the hands of the #4 seed. A major victory and hopefully a situation rectified at Nationals in May. The mornings would be a challenge for Coach John Spack and his BlackJacks, the #11 seed would be tough to move up on with top level competition in your pool from the get go. They got their lessons early with convincing losses to Storm and top ranked South County. But as required the old master got the team off the mat and a gritty three set win over E381 would secure the hope of an easier path to a top 16 finish on Sunday. Saturday dawned and the ‘Jacks dealt the blows to two sets of Titans in straight sets but fell in a tough 3 set affair to the Lightning (I told him not to split that pair and stick at 16). So off to Sunday in good position for a run at the top 8 a finish that would be a boost up from the 11 seed. In the early hours the girls came out with a great performance and punctuated their top 8 placement with a big win over the #4 seed Pakmen, what a statement! However the spoils of that victory were a rematch with South County (#3) and as it was on Friday it was again, the SC Bandits who ran the house out of cards and advanced to the Semis in a well fought 3 game contest. Take from this the fact that many players were injured throughout a tough season for the BlackJacks and now that they have tasted both competition and even victory over top level teams we can’t wait to watch first hand in Waterloo the fruits of this labour. Coach Pat Henderson and the Wildcards were back in Waterloo for their second OC’s in less than a month after competing in the 17u tournament. Hoping that experience would lead to a more relaxed team and determined attitude the ‘Cards found themselves sporting the #17 seed. The opening pool should be one they would manage however an opening 26-28 set loss to LVC may have damaged the confidence and before long the Wildcards were down two matches and fighting for their lives. A win over Markham by the tightest of margins left them reeling and that singular win secured only third in the pool and no chance to move to the top Tier. Now the battle was uphill mentally for both the players and coaches. Wins over LVC and Northumberland in straight sets were good but a three set loss to Northern Chill dropped them to second, making the journey a little tougher. An opening Sunday win over the Titans from Etobicoke was followed by a loss to LVC’s 15u Intensity and the end was here. A drop in standings that would sting, but hopefully provide fodder for the training gym and a return to Waterloo for Nationals. IN the afternoon the Div 2 girls would take the court and at 25th seed the Gamblers had lots of room to improve and show their stuff. Coach Joel Bergeron has worked hard all season and the girls wanted to prove it. When day 1 was complete the seeding looked like it might fit as the team lost opening matches to Chatham and Niagara then took the third over ThunderCats Black. Sitting right where they started a Div 2 Tier 2 placement was the only outcome available. Ok so reality check, let’s make the best of this! Knuckle down and take charge! Well that message was heard and the Gamblers took their chances all the way to the bank. Day two would be perfect with wins over Galaxy, Forest City and Markham Wildcats. On to the playoffs and an opening match scare but the Fury was followed by wins over Forest City 15 and Mustang Volleyball. But the run came to an end with a loss to the Milton Razors Edge another team with a mission to finish high. So after all this the 25 seed moved all the way up to the 17th spot, again a victory in determination and fortitude on behalf of all. Well said coach and well done ladies the end of the day on day #3 is a tired time but a win in your final 2016 OVA match has to be reason to smile all the way home.